Charles Ross & Son Company has expanded its inventory of Low Pressure Drop (LPD/LLPD) and Interfacial Surface Generators (ISG) Static Mixers to meet customer demand. Many popular sizes are now available from stock to just two weeks from receipt of order. The LPD/LLPD models are widely used for low viscosity, turbulent flow mixing of fluids and for gas-liquid, gas-gas mixing. These units are offered from 1" to 30" in diameter, either as complete plug-in modules or as mixer element inserts for installation into the user's existing pipe or tubing. Sample applications include blending different grades of oil or gasoline, dilution, water and wastewater treatment, pipeline reactions, emulsification, biodiesel production, homogenizing process streams prior to sampling points, pH control, heat transfer, and even blending of free-flowing solids. The ISG model consists of specially machined elements with passageways ideal for preparing viscous mixtures within a very short length of pipe. This patented design (US Patent No. 3404869) is used for a variety of processes including thermal and color blending, delustering of polymer dopes, preparing water/fuel oil emulsions, injection molding and extrusion, inline mixing of catalysts or additives into a viscous fluid, fiber production, etc. 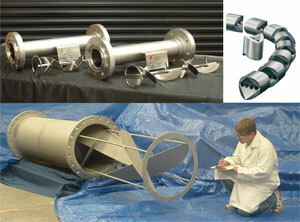 Standard ISG elements are supplied from 5/8" to 6" diameter in stainless steel, polypropylene and Teflon. Ross motionless mixers are easily customized to include special coatings on the product contact surfaces, sanitary finish and construction, injection ports for minor product streams, different styles of end connections (flanged, threaded, tri-clamp), heating/cooling jacket, etc. Ross also offers static mixer skid systems complete with piping, pumps, flow meters and controls all mounted to a portable skid. Call 1-800-243-ROSS for more information or to discuss your static mixing requirements.